In this image from 2016, a migrant tries to open a border fence at a makeshift camp at the Greek-Macedonian border near the village of Idomeni, Greece. The United Nations is not the fastest moving body in the world. It often takes decades for new ideas to become part and parcel of the UN agenda and worldview. But yesterday, it appears that something new is happening — and it could have significance for millions, particularly in the parts of the world CNEWA serves. It happened at a side event hosted by the Permanent Observer Mission of the Holy See, the International Catholic Migration Commission, Caritas Internationalis and the Center for Migration Studies. The event was for “ensuring the right of all to remain in dignity, peace and security in their countries of origin.” The concept emerging that is new and which kept surfacing at the event was the Right to Remain. In sum: the event participants recognized that most refugees and migrants do not want to leave their homes and, when forced to, want to return as soon as possible. What results is the Right to Remain — which, the event stated, precedes the Right to Migrate. While migration is and remains a right, migration is often the less desirable solution. Thus it is recognized that for most migrants migration is not a free choice but is forced upon them by what the event called “Drivers of Forced Migration.” The major “drivers of forced migration” are: climate change, economic underdevelopment and internal conflicts.The Right to Remain stresses that people have the right to have these drivers removed, so they can remain in the native countries. Clearly the issue of refugees and migrants has been a major concern at the UN. It is estimated that over 65 million people on the planet are in one way or another refugees or migrants (in what follows, the words migrant and migration will include refugees). The flow of these people from Africa and the Middle East has put European and other countries under tremendous economic, political and social pressures. In some areas the migration problem has bred nativist, xenophobic and often racist reactions which manifest themselves in different ways in different countries. For example, the rise of ethno-nationalist and rightist populist groups — political and otherwise — has been a concern for many. The UN and Pope Francis have been consistent in calling for programs to help and accept people who are fleeing from their homes. The UN High Commission for Refugees (UNHCR) is responding to a situation of mass migration that has not been seen for at least a hundred years. While continuing to defend the right of people to migrate, however, the event recognized that migration must be: 1) sustainable, 2) manageable and 3) a choice, indicating that at present it is too often none of these. This recognizes not only the legitimate issues of the migrants but also of the receiving countries. Recognizing the priority of the Right to Remain, the Holy See and its colleagues did not in any way question the right to migrate. However, it laid great emphasis on the fact that migration must be a free choice and that people have the right to have problems solved which are drivers of forced migration in their own countries. Clearly at this point the Right to Remain does not enjoy the same legal standing in international humanitarian law as does the Right to Migrate. However, there is the recognition that migration must be sustainable, manageable and a free choice together with the indication and that such is not the case at present. This is leading to the the gradual emergence of a Right to Remain. And, as I noted: this is something new and significant. It recognizes the rights of both migrants and receiving countries. And it provides a significant impulse towards making a Right to Remain one of the basic human rights. Helping people to achieve a standard of living that is sustainable and human has been one of the major efforts of CNEWA. While CNEWA has not spoken of the Right to Remain or the Drivers of Forced Migration, in fact, almost all of our programs are geared to make it possible for people to remain in their homes in dignity, peace and security. People leave flowers in St. Anne’s Square on 23 May 2017 in Manchester, England. U.S. President Donald Trump and first lady Melania Trump speak to Greek Orthodox Patriarch Theophilos III of Jerusalem after visiting the Church of the Holy Sepulchre 22 May. Following his official welcome to Jerusalem by Israeli President Reuven Rivlin, U.S. President Donald Trump began his two-day visit to Israel and the Palestinian territories with a private visit to the Church of the Holy Sepulchre and Western Wall. Details of the visits to the holy sites had been a carefully guarded secret until the last moment, but from early 22 May the alleyways of the Old City were closed to both residents and tourists, and the main thoroughfares leading to the Old City were closed off to all traffic. Under tight security and led by the traditional kawas honor guard announcing the way with the thumping of their ornamental staffs, the president made his way by foot through the Old City’s alleyways to the Church of the Holy Sepulchre. He and first lady Melania Trump were welcomed at the entrance of the church courtyard by Greek Orthodox Patriarch Archbishop Theophilos III; Franciscan Father Francesco Patton, custos of the Holy Land; and Armenian Patriarch Nourhan Manougian. The president spoke briefly to the religious leaders and stopped at the entrance of the church for a group photograph after also speaking to a few other religious. Trump, who also was accompanied into the church by his daughter, Ivanka Trump, and son-in-law, Jared Kushner, spent about 30 minutes in the church, which encompasses the area where, according to Christian tradition, Jesus was crucified, buried and later rose from the dead. At the entrance of the church is the stone of unction, where tradition holds that Jesus’ body was laid out and washed after his crucifixion. Inside the central rotunda is the newly renovated Edicule, where Jesus was buried. The delegation then walked the short distance to the Western Wall plaza, where Trump was greeted by Rabbi Shmuel Rabinowitz, rabbi of the Western Wall. Wearing the traditional Jewish kippa or skullcap, Trump walked alone to the wall, where he placed his hands on the stones for several minutes. He then placed a note with a prayer into a crack in the wall, a Jewish tradition. Melania and Ivanka Trump visited the women’s section of the wall separately, and the first lady spent a few minutes silently in front of the wall, touching it with her hand. Trump is the first sitting president to visit the Western Wall in the contested Old City of Jerusalem. Both Israelis and Palestinians claim Jerusalem as their capital city. The Western Wall, considered the holiest site for Judaism today as a remnant of the retaining wall of the Biblical Jewish Temple, also surrounds the Temple Mount/Haram al-Sharif compound, where the Jewish temple once stood and the location of Al-Aqsa mosque, Islam’s third-holiest site. Avoiding any symbolic controversy involving the issue of the city’s sovereignty, the Trump administration insisted the visit to the sites be private, vexing Israel by Trump’s refusal to be accompanied by Israeli political leaders to the Western Wall. Meanwhile, Palestinians said Israel had not allowed a Greek Orthodox Scout marching band to accompany the delegation to Church of the Holy Sepulchre as planned because of the Palestinian flags on their uniform. A spokesman from the Israeli Ministry of Foreign Affairs denied any Israeli involvement in the matter, suggesting that it might have been a U.S. security issue. In a visit that encompasses both political and religious symbolism, Trump spent two days in Riyadh, Saudi Arabia, with King Salman and other Muslim leaders. He was scheduled to meet with Palestinian President Mahmoud Abbas 23 May in Bethlehem, West Bank, and was expected to urge the Palestinian leader to take productive steps toward peace. According to media reports, he did not plan to visit Bethlehem’s Church of the Nativity because of an exhibit there supporting hunger-striking Palestinian prisoners in Israeli jails. The next leg of his first overseas trip as president is slated to include a visit to the Vatican as well as to Brussels. Clergymen are seen as they wait for the arrival of U.S. President Donald Trump for a welcoming ceremony 22 May at Ben Gurion International Airport in Lod, near Tel Aviv. Syrian opposition fighters, who were evacuated from the last opposition-held district in the central city of Homs, embrace as they arrive in the Maaret al-Ikhwaan village north of Idlib, on 22 May 2017. The Syrian regime on 21 May regained total control of the central city of Homs with the evacuation of rebels from the last area they had controlled. Today, we received more stirring images from Michael J. La Civita. He and Thomas Varghese, CNEWA’s director of programs, are on a pastoral visit to the Caucasus. There is poverty, and then there is grinding poverty. For many reasons, but I will start with corruption and tragedy, almost half of Armenia’s people have endured decades of want: want of shelter, heat, food, water and health. What they have in abundance is dignity. My friend and colleague, Thomas, today visited people who this past winter needed help to heat their homes and needed, as well, food to eat. Unemployment in the Gyumri region is more than 70 percent. Many of the people we visited today live in “temporary” housing since their homes and their lives were destroyed in the great earthquake in 1988. Yes I said temporary. Sheds made of corrugated tin — some with electricity, others not. Bathrooms are holes in the ground. Thanks to Caritas Armenia, families are receiving help, and I am pleased CNEWA is there in support. But I am frustrated that what we do is but a drop in the bucket. The tears here, and the desolation, are heartbreaking. 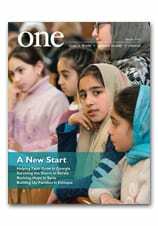 Read more about the work of CNEWA and Caritas Armenia, in A Letter from Armenia in the Summer 2015 edition of ONE. Pope Francis greets a resident as he arrives to give an Easter blessing to a home in a public housing complex in Ostia, a Rome suburb on the Mediterranean Sea, 19 May. Continuing his Mercy Friday visits, the pope blessed a dozen homes in Ostia. Like parish priests throughout Italy do during the Easter season, Pope Francis spent an afternoon 19 May going door to door and blessing homes. Continuing the “Mercy Friday” visits he began during the Year of Mercy, Pope Francis chose a public housing complex in Ostia, a Rome suburb on the Mediterranean Sea. The Vatican press office said Father Plinio Poncina, pastor of Stella Maris parish, put up signs 17 May announcing a priest would be visiting the neighborhood to bless houses. The signs, which indicate a date and give a time frame, are a common site in Italy in the weeks before and after Easter. “It was a great surprise today when, instead of the pastor, the one ringing the door bells was Pope Francis,” the press office said. “With great simplicity, he interacted with the families, he blessed a dozen apartments” and left rosaries for the residents. “Joking, he apologized for disturbing people, however he reassured them that he had respected the hour of silence for a nap after lunch in accordance with the sign posted at the entrance to the building,” the press office said. The pope’s Friday visits to hospitals and hospices, homes for children, rehab centers and other places of care were planned for the Year of Mercy as tangible ways for the pope to practice the corporal and spiritual works of mercy. Although the Year of Mercy ended in November, the pope restarted making Mercy Friday visits in March when he visited a home and educational center for the blind and visually impaired.